History’s most heavily horse-powered Popemobile is searching for a new garage. That’s right: Papa Francesco’s white-embossed, golden-striped Lamborghini Huracan, a gift from the Italian automakers late last year, is hitting auction, penciled-in as lot #161 for Sotheby’s May 12th sale. Naturally, the Argentine pontificate plans to donate the cash, with the ISIS-besieged Iraqi city of Nineveh and three equally worthy non-profits listed among the beneficiaries. At the moment, Sotheby’s is looking for $305-425K … but we have to imagine the final tally will run far beyond that. And it should! A Mark McGwire home-run balls once sold for $3M; a stunning Lambo (with very few miles — it’s not like His Holiness is doing laps around the Colosseum each night) that’s been blessed and signed should fetch a respectable number, especially given the destination of the proceeds. Besides, it really is a stunning car. 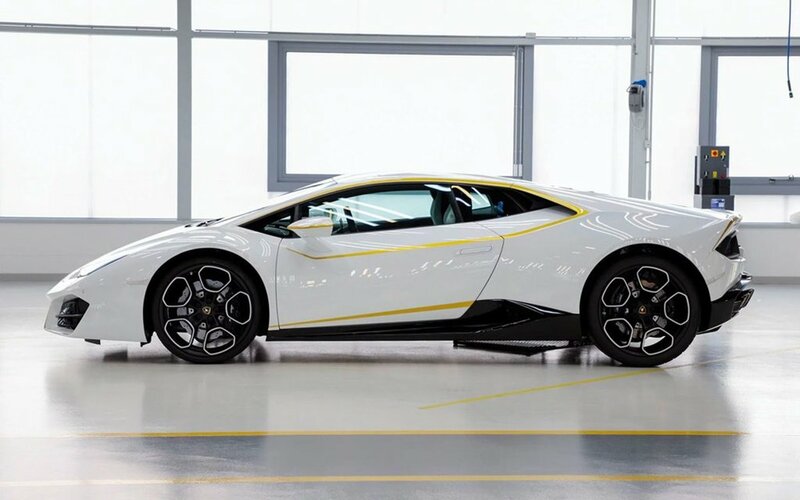 Originally offered to the Pope as part of Lamborghini’s “Ad Personam” customization initiative, there’s no literally no auto like it in the world. The colors represent Francis’s garments, along with the official Vatican City flag, while the interior features Bianco Leda Sportivo leather. Then there are are the wheels, which are inlaid with diamonds. So clean out the garage, visit confession and good luck.